A new revolution in lipstick. To meet the needs of professional make up artists and extreme environments, Dany Sanz has developed a long-lasting and waterproof formula guaranteeing an impeccable makeup look for all women. Aqua Rouge is a waterproof, long-wear, non-transferable lip colour. 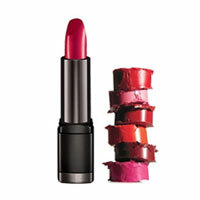 The highly pigmented formula creates a rich, intense colour without drying the lips. The dual ended formula allows you to have a matte or high gloss finish, depending on your look and your mood. In colours designed to match the Make Up For Ever Aqua Lip Waterproof Pencils, it is easy to get the perfect lip. First step: the liquid lip color delivers an intense and high coverage matte color. Aqua Rouge comes in highly pigmented waterproof shades, from natural beiges to dramatic reds, plus one transparent topcoat.